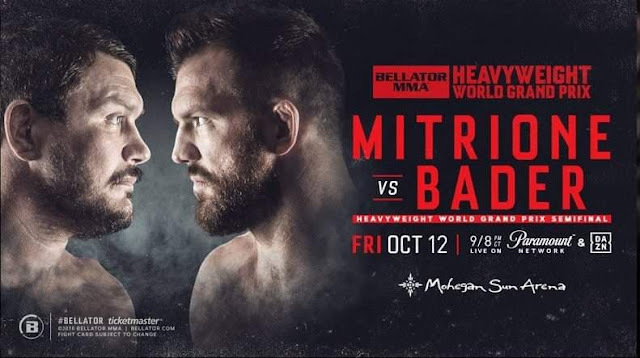 Friday, October 12th Bellator once again takes over the Mohegan Sun Arena at Mohegan Sun Casino in Uncasville, Connecticut as the promotion sets its sights, once again, on crowning their next Heavyweight Champion. The Bellator Heavyweight Grand Prix Tournament which began in January with eight fighters, is now down to just four men, as former UFC Light-Heavyweight and current Bellator Light-Heavyweight Champion; Ryan “Darth” Bader (25-5) opens up the semifinal round with a tough test, in fellow UFC allumn and natural Heavyweight; Matt Mitrione (13-5). With the other side of the Heavyweight Grand Prix bracket coming to it’s culmination the following evening as “The Last Emperor” Fedor Emelianenko (37-5) faces off with “The American Gangster” Chael Sonnen (30-15) at Bellator 208 live from the Nassau Coliseum in Long Island, New York on Saturday, October 13th. With both victorious parties facing off for the vacant Bellator Heavyweight Belt to be decided at a future event, likely in early 2019. As always Bellator has used it’s high octane headliners to help promote a fantastic card that will be littered with some of the top talent in the Northeast region, with many current and former regional champions or contenders set to do battle on the night’s undercard. But before we get into the undercard let’s take a closer look at the rest of the main card which airs live on Paramount Network at 9pm est. Friday night. Notes: Banks is just what you would expect out of a fighter from Iowa; a talented, grueling wrestler who likes to use dominant position to grind his opponents out. Banks will be coming off his first professional loss; as he was submitted by Adam Piccolotti (9-2) with under twenty seconds left in their fight at Bellator 199 in May. Tristar Gym’s (Canada) Nallo will be looking for the exact opposite approach to this fight; Nallo’s six fight professional career has seen him go undefeated, finishing each of his six fights, with five of those finishes coming in the first round. We should know early on in this fight; which fighter is going to be able to instill their game plan? Notes: Most casual fans will recognize the “Baby Slice” name as the son of the late Kimbo Slice and he is just that, with the killer instinct that has finished his last three opponents in the first round, however unlike his father; Kimbo, Baby Slice has the ability to finish fights on the ground, as well as on the feet. Browning, a natural Featherweight, has also shown the ability to be a finisher in the cage, starting his career off 3-0 with 3 finishes. Over his last two fights however, Browning is 0-2 and has been the man getting finished, as he looks to bounce back, against his toughest opponent to date and in his Bellator debut against; Baby Slice. Notes: After coming over to Bellator from the UFC; Lorenz Larkin has been immediately thrown into the buzzsaw at 170 pounds. Suffering losses to Douglas Lima and Paul Daley in his first two fights for the promotion, Larkin secured his first Bellator win last time out against Bellator veteran Fernando Gonzalez, as Larkin continues the climb back into title contention in Bellator’s stacked Welterweight Division. Speaking of buzzsaws, Romania’s Pascu will be making just his second appearance for the Bellator organization after losing a decision to undefeated prospect; Ed Ruth (6-0) at Bellator 196 in April, Poscu will be looking to stage the upset against Larkin to notch his first Bellator victory. Notes: The perfect mix of Big Beard, Beer Belly, Granite Chin, Nasty Knockout Power and Veteran Technical Ability; Roy “Big Country” Nelson looks to add to his accolades, yet another Legend of Heavyweight Combat Sports; when the Heavy Handed Heavyweight crosses paths with Russian veteran skriker; Sergei “The Paratrooper” Kharitonov. Kharitonov’s nearly two decade run at Heavyweight has amassed 28 victories for global promotions; Pride FC, Strikeforce, Dream, K-1, M-1 and Bellator, collecting a nearly impossible 26 finishes and having gone to the judges just three times in his entire 35 fight career. This is a matchup with Legendary status and the kind of fight with potential to become an all out slugfest with someone landing a vicious knockout! Notes: This fight holds an epic amount of nostalgia for me personally, Ryan Bader’s victory on The Ultimate Fighter season 8 in 2008 is one of my first recollections from my booming interest in Combat Sports, then in 2010 as an already avid sports card collector, I opened my first pack of Topps UFC cards, which then sparked my interest into following many fighters careers closely, as well as amassing collections of some of my very favorite fighters; none of which I have focused harder on than Ryan Bader. Along with following his career from an Undefeated Prospect to the now Bellator Light-Heavyweight Champion, in pursuit of the Bellator Heavyweight Championship, I have built a collection of Ryan Bader cards that reaches over 850 autographs as well as thousands of other cards with varied amounts of rarity and value. And for that I will forever be a fan of Ryan Bader. With that said Bader is entering this bout the much smaller man, as Mitrione is a natural Heavyweight with a Wrestling pedigree and a chin of steel, Bader possesses top level wrestling as well but that advantage will often sway to the bigger man. Bader will have the technical striking advantage and the gas tank to push the pace on Mitrione and test the bigger man’s cardio. Mitrione will not only have size on his side but a pair of powerful hands that have the ability to drop any man dead in their tracks. Needless to say I am excited for this Main Event! Notes: Bellator MMA may have “caught lightning in a bottle” when they signed the, then 20 year old, Connecticut native Michael Kimbel to a multi-fight contract following his first round drubbing of Geoffrey Then at Bellator 194 in February. New York’s Alex Potts is now 14 months removed from a similar professional debut with Bellator MMA; as he kept his career record unblemished with an early Kimura submission of Brandon Polcare at Bellator 182. Both of these young prospects are eager to get back in the Bellator cage, as they continue their rise up the promotion’s Bantamweight ranks. Notes: Fresh off a war with Christopher Curtis (19-5, arguably the best Welterweight not currently signed to the UFC) on Dana White’s Tuesday Night Contender Series that resulted in a tough third round TKO loss; Sean Lally is back home in New England and looking to prove why he is one of the most feared Welterweights in the Northeast. A perfect mix of speed and natural power make Lally one of the most dangerous strikers to call New England home. New England Fights’ Welterweight Champion; Kemran Lachinov backs down to no man and will be looking to take the fight to Lally, Lachinov’s grappling and submission skills have the ability to suffocate his opponents as the fellow New Englander Lachinov is looking to sway the Regional Welterweight tides in his favor. Notes: Team Slaughterhouse Connecticut’s Kastriot Xhema is a “kill or be killed” type of fighter, his three professional fights have ended by first round knockout; resulting in two wins in the Bellator cage when he knocked out Nick Alley and Peter Nascimento at Bellator 178 and 194 respectively. Enter Team Link standout Pat Casey, who is a game of an opponent as it gets here in New England, Casey’s resume includes an impressive combined record of 10-2 fighting anywhere from Lightweight to Middleweight throughout his amateur and professional career. Casey is a well rounded fighter with the abilities to hang with nearly any man both on the feet as well as on the mat, Casey will however, be coming into this fight with an advantage in the grappling department and should possess a deeper gas tank then the flashy striker Xhema. Stylistically this should be a fun fight to watch, between two of the top Welterweight prospects here in New England. Notes: SBG Ireland Striker Sinead Kavanagh is looking to punch her promotional record over the .500 mark Friday night when she squares off with fellow finisher; Janay Harding. Australia's Harding will also be looking to break the .500 mark for her career as she searches for her fourth career victory by Knockout. Both women have shown a knack for knocking their opponents out in the past, and I see this fight being no different, these girls are out for blood. Notes: Undefeated in her amateur career, New York’s Alexandra Ballou will make her highly anticipated professional debut, just 51 weeks after she made her amateur debut in October of last year. Ballou will make her debut against New England veteran Lisa Blaine, who is the same 51 weeks removed from her last win, when she upset Ana Julaton at Bellator 185. Since her Bellator 185 win, Blaine has wound up on the wrong side of two decisions, both in the Premier FC promotion. Blaine will be looking to claw her way back into the win column as she matches skills with the upstart prospect; Alexandra Ballou. Notes: Portugal native and current AKA Knockout artist Andre Fialho was due to square off with Connecticut’s “Irish” Brennan Ward on Bellator 207’s main card. However, Ward retired from MMA to pursue a career in Bare Knuckle Boxing shortly after the matchup with Fialho was announced. Enter; Mexico’s Javier Torres, a submission specialist who owns four career submission victories to go along with two knockouts over his ten professional victories. Don’t blink once the bell sounds on this fight, this fight probably won’t make it out of the first round. Notes: After a 2-0 start to open her career landed her a chance for a spot on The Ultimate Fighter Season 23, Kristi ran into fellow prospect JJ Aldrich in The Ultimate Fighter cage. Lopez fell short in a decision against Aldrich ending her time on The Ultimate Fighter, leading to her signing with Bellator. Lopez fought Jessica Sotack to a draw at Bellator 182 in her promotional debut and looks for Bellator 207 to notch her first promotional victory. Lopez draws New England Muay Thai specialist; Sarah Click who’s stylistic striking is amongst the best in the region’s Women’s divisions. Click is very talented on the feet and will be looking to put pressure on Lopez from the word “Go” in this matchup. Notes: Coming in at 9-1; New Hampshire’s Tim Caron sits atop the Middleweight Division here in New England, after a loss to Jordan Williams on Dana White’s Tuesday Night Contender Series was ruled a No Contest due to a failed post fight drug test by Williams, Caron sets his eyes on Bellator 207 as he seeks his tenth professional victory, in what will be his fourth start for the promotion. Standing across the cage from Caron will be Brazilian Vinicius de Jesus who will be making his third straight appearance in the Bellator cage and hoping to bounce back off a narrow split decision loss to Joaquin Buckley at Bellator 185. This is a high level fight with great potential as Bellator 207 kicks off with a banger in the Middleweight division! Stay with WESTERNMASSMMA.com throughout the night Friday for live up to the minute results of the Bellator 207 fight card.